I see a lot of pitch decks. Hundreds per year. Almost every one is wrong. Not the startup idea. Not the slide layout. Not the facts per se. But which facts and in what order. Nearly all founders use a structure guaranteed to kill their “conversion rate”. The common flaw stems from a fundamental mismatch in the way our brains create versus consume content. Each engages a different forms of reasoning. I studied this general topic in graduate school under one of the pioneers in the field. I kept up with the literature over the years. And I observed a huge number of pitches. But it still took me years to realize what was happening (repeating the same mistake in my own pitches, of course). Once I did, I couldn’t help appreciating the ironic beauty of the situation. Now, when you build a pitch deck, you have to call on System 2 to develop the content. System 2 is logical so you can’t help but try to construct a deductive proof of why someone should invest in your company. That’s why most pitches have 3-7 slides setting the stage: here’s the problem, here’s the size of the problem, here are the current solutions, here are the drawbacks of current solutions, here are the requirements for a better solution…” I refer to this pattern as “In the Beginning”. However, when investors consume that pitch deck, either at Demo Day, in an email, or face-to-face, they call on System 1. For most people in most situations, System 1 is the default. System 2 takes much more energy and operates much more slowly, so it only gets called on when something special happens. Thus, unless your pitch quickly triggers investors’ System 1s to recognize your company as a tasty dinner, their System 2s will never wake up and no amount of logic can help you. And then when you use your System 2 to try and improve your pitch, you’ll be blind to the problem. You may be wondering why none of your advisers notice this problem when they reviewed your deck or watched a practice pitch? Here’s another ironic bit. People who sincerely want to help with your pitch will expend the effort to use System 2, also blinding them to the lack of System 1 appeal. Perhaps the worst case of “In the Beginning” I’ve seen was at a pitch event several years ago with a brutal schedule of 12 fifteen-minute slots. A company in the last hour really started at the beginning: the last generation of technology, quotes on recent shortcomings of that generation, market sizing for the next generation, the founders’ previous experience designing this type of system, technical architecture of their new solution, and performance metrics versus the primary incumbent. Logical, but not engaging. Ran over his time and had to rush through the last slide, which was something along the lines of logos for 5 blue chip enterprise customers, an average annual contract value of $60K/year, and current $MRR of $35K/month with 20% MoM growth for 6 months. WTF? By the time that slide flashed on the screen, 80% of the audience members were fiddling with their cellphones or chatting with their neighbors. Talk about a missed opportunity! Better to just show that last slide, drop the mike, and walk off the stage! Putting the Ask right after the Boom is key. The Boom triggers alertness and primes for action. Then you’ve got to give the investors something to pursue. Otherwise, you may lose their interest. Also, telling them about good stuff that will happen in the future right after good stuff that has already happened in the past naturally gives your good-stuff-forecast more credibility. Your investment ask will seem maximally reasonable at this point. My guess is that most founders’ pitch decks already contains 80%+ of this content. It’s just in the wrong order and probably too much detail on Context and Why. The big question you probably have is, “What should my Boom be?” Sorry, no blanket advice here. It’s situation dependent. But guess what? By simplifying the problem to one question, we’ve made it amenable to A/B testing. If your Boom isn’t obvious, generate 3-7 alternatives and test them against several investors each. Also, if you can’t come up with a decent Boom, it might be a signal that you haven’t made enough progress to fundraise with much success. So your near term goal becomes to make something Boom-worthy happen. That’s my preliminary diagnosis and treatment. I’ve given this advice face-to-face to many startups over the past two years and have received a lot of positive feedback. But it’s an inherently limited sample. So if you read this post, try out the approach, and learn anything interesting (positive or negative), please drop me a line and let me know! Maybe someday we’ll be able to develop a thoroughly researched system of Evidence Based Pitching (EBP). Regular readers know that I’ve been trying to bust the “Seed Bubble” myth for years. 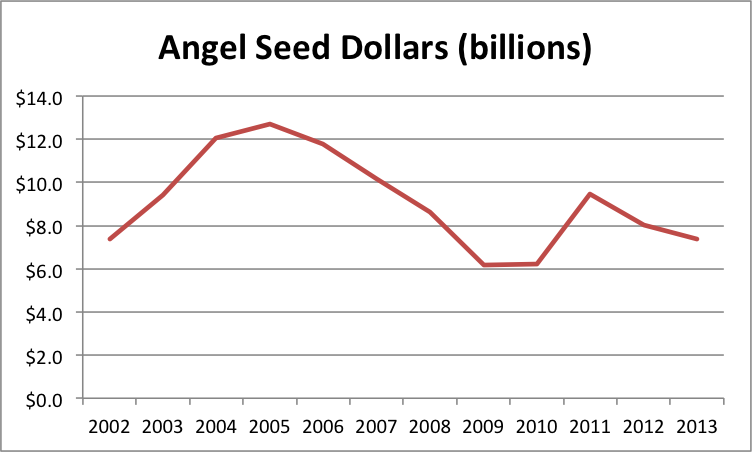 In my latest analysis, I show that total seed funding in 2014 was nearly identical to that in 2008, not even adjusting for inflation or economic growth. Over the last year, I’ve encountered several other persistent VC myths that similarly conflict with the data. Given that the seed bubble meme seems to be subsiding (though I dispute talk of a nonexistent bubble “popping”), I thought I’d tilt at some of these other windmills. OK, so let’s look at the data on Early Stage VC dollars and deals from the NVCA. Hmm. I’m having trouble seeing much of a “crunch”. Pretty much up and to the right since 2009. Perhaps a slight valuation correction from 2011 to 2012, but deal volume was still going up. Certainly not a “nuclear winter”. Basic version of the myth.. busted. Now, if you’ve read my Seed Bubble posts, you know that seed capital has not been “free flowing” over the past few years. But even I was shocked at the stark reality when I overlay VC Early and All Seed funding on the same graph. For a long time, seed funding was much greater than VC Early funding–twice the size or more. Then VC Early started to creep up. During the period of the supposed “Series A Crunch”, VC Early funding was actually shooting up from about 10% less to 60% more than All Seed. In fact, the ratio of VC Early to Seed tied the all time high in 2011 when the crunch supposedly began, then nearly doubled that record by 2014. If there’s an imbalance by historical standards, it’s the opposite direction! Obviously, if people managing investment portfolios believe the Series A Crunch or Seed – Series A Imbalance myths, they won’t allocate dollars across startup stages correctly. This trap is compounded by a misimpression of the stages themselves. Many investors believe they are allocated to “seed” when in fact they have only fractional exposure to “something VCs call seed but is vastly different from the rest of the seed market.” From an allocation perspective, misidentifying your asset classes is a huge danger. The ratio rose from about 4X in 2002 to 11.5X in 2014, with a peak of 14.5X in 2009. 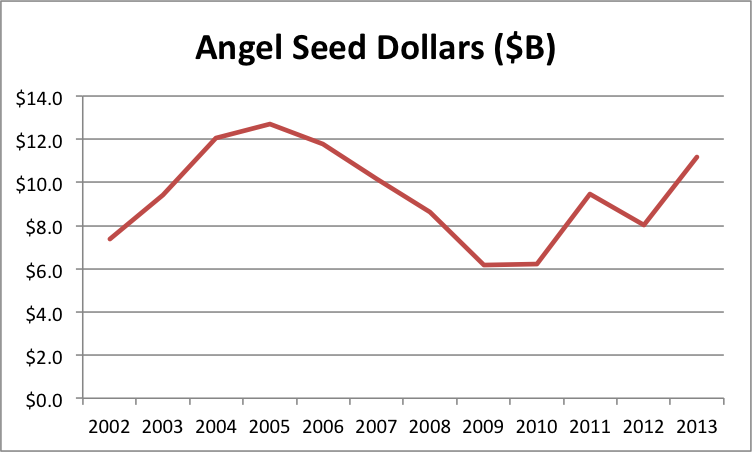 There’s clearly a categorical difference between what VCs and angels call seed. Moreover, if you invest in an early stage VC fund, at best a modest fraction of each dollar actually goes to seed. Most early stage VCs make only a small subset of their initial investments at the round they call seed (unsurprisingly, most of the money goes into the round they call “early”). Moreover, even funds who always make their initial investments at what they call seed generally reserve at least $1 of follow-on for each initial $1. So at absolute best, investors who think they have seed exposure through VCs are getting half their dollars exposed to only the tiny slice of the seed market that accounts for the largest deals. The share of this very high end of the market dropped precipitously in 2011. In my opinion, the combination of all these factors means most investors in funds are dramatically under-allocated to over 90% of the seed stage technology startup market–a market that’s roughly the same size as the Early Stage VC market. In 2014, 73% of technology companies acquired never took traditional VC. So if you believe that that VC Seed gets you exposure to the entire seed stage startup asset class, your portfolio will lack exposure to 3/4 of the liquidity options. By the way, this statistic is up from 2/3 in 2013. And with record amounts of cash on the large technology company balance sheets that make these acquisitions, I could easily see this bias growing further. Imagine a portfolio that lacks exposure to 80% or 90% of the liquidity events in that asset class! This third party data dovetails nicely with my previous calculation of a massive difference in the small M&A vs IPO and large M&A market. I will stipulate that the VC-backed exits are almost certainly each bigger. But the goal of portfolio allocation is to balance out risks within and across asset classes. The data makes it clear that relying on VC Seed leaves a portfolio exposed to idiosyncratic risks within a particularly narrow exit market. So finding some way to target the other 90% of the seed stage technology startup market seems like prudent portfolio construction. Of course, there may be different data out there or I may have botched the crunching somehow. So as always, feel free to check the work on my spreadsheet. 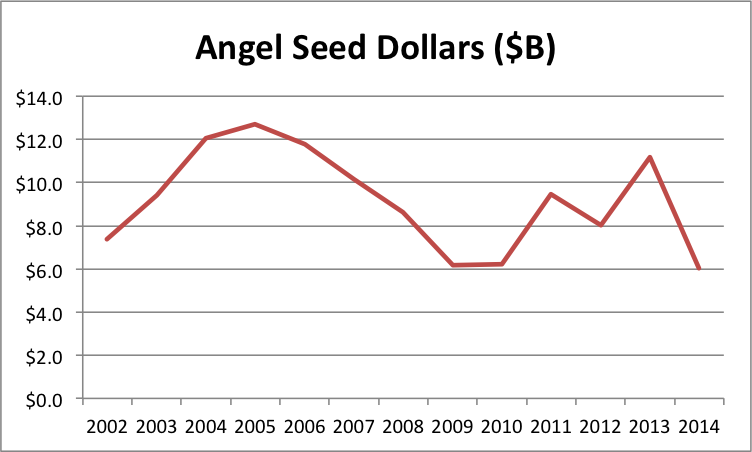 From angels, seed stage funding plunged nearly 50%, from $11.2B to $6.0B. From VCs, seed stage funding dropped about 25%, from $940M to $740M. But median seed valuations increased 20%, from $2.5M to $3.0M. The run up of a bubble does not typically include sharp volume drops, but the price rise may indicate something interesting is going on. See here, here, here, here, here, here, and here for previous posts in this thread. My data sources are the Center for Venture Research for angel data, the NVCA for VC data, and my personal tracking spreadsheet for “super angel” funds not part of the NVCA. I use the HALO report for pricing data. Out of concern that one possible explanation for individual angel investments dropping is a shift to angel funds, I reconstructed my angel fund tracking spreadsheet from scratch. I was worried that my list of funds was too haphazard. So I pulled a longer, hopefully more complete, list of micro VC firms from CB Insights. I then removed ones that are members of the NVCA, whose investments should already be included in that data. I also went through fund CrunchBase listings and Web sites, filtering out those who invest primarily outside the US or not at the seed stage. I noted the reason for any such exclusions in my latest spreadsheet. This updated source contains 74 funds totaling $3.2B, while my 2013 source contained 29 funds totaling $1.2B—a substantial increase in coverage. There were also 23 funds on the new list for whom I could not find dollar amounts. However, I assume each fund with dollar amounts is completely deployed in the current year so the total should still be a gracious estimate given that even very fast funds actually deploy over two or three years. The big question is how do you get a pronounced volume drop and a pronounced price increase? First, one of the data sources could have a problem. The obvious candidate here is the CVR angel data because it accounts for most of the total volume I track, the methods aren’t documented, and this is its biggest one-year drop ever. According to the latest report, total angel investment volume was only down 2.8%. But the proportion of seed and early investment plummeted from 45% to 25%. I can think of several reasons for a potential measurement inconsistencies here. Note that the 2012 measurement was 35% so it has a lot volatility. Similarly, the CB Insights pricing data could be the result of an anomaly, as it also experienced its biggest one-year move. In contrast to CB Insights’ 20% jump in valuations, the CVR valuation data showed a slight decrease across all stages (but the CVR valuation data is reported inconsistently, so I have avoided using it in the past). Of course, the CB Insights and CVR data collection methods could somehow result in systematically different samples that explain the conflicting data. There’s another explanation that I find tantalizing, if only because it would confirm my hypothesis that founder opportunity cost drives the earliest company valuations. Think of seed stage companies as “supplying” investments and investors “consuming” them. Econ 101 says that a simultaneous decrease in volume and increase in price implies that the supply curve has shifted left. It’s like a freeze wiping out a significant fraction of the orange crop. People buy less at higher prices because there’s a shortage. But why would this happen now in the seed stage startup market? I have a guess: the macroeconomy recovered. Unemployment eased from 7.5% in June 2013 to 6.1% in June 2014. Moreover, according to Indeed.com, software engineering salaries jumped 20% in 4Q2013. All of a sudden, the opportunity cost of founding a seed stage startup went up dramatically. That could definitely have an effect on formation rates, which would show up first in the seed stage funding data. Another “supply side” explanation would be that founders simply need less money to advance their ideas past the seed stage. The total number of angel-funded deals actually went up 3.8% according to the CVR report. At RSCM, we’ve certainly seen no shortage of quality opportunities at low valuations. If anything, we are deluged. Of course, we purposely focus on smaller deals so we wouldn’t expect to see any shortage if lower capital requirements were the underlying cause. Our experience is also consistent with a data collection anomaly. I’d love to get my hands on a good dataset for accelerator program application volume. That might allow us to distinguish between declines in formation rates and capital requirements. 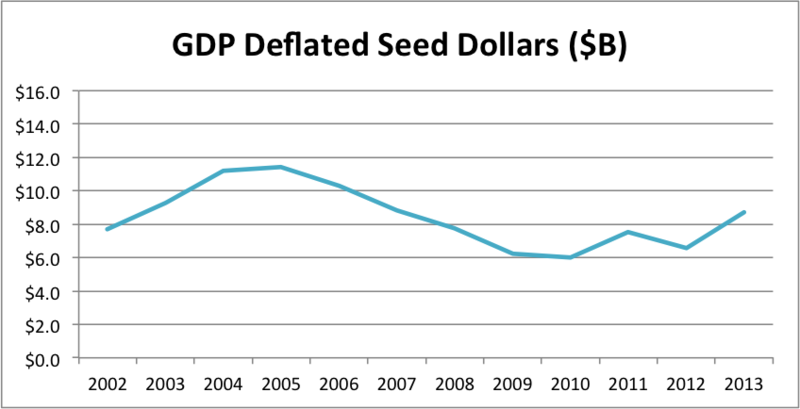 Bottom line: I’m still very skeptical that there is a seed stage bubble. In nominal terms, we roughly equaled the global peak from 2005. 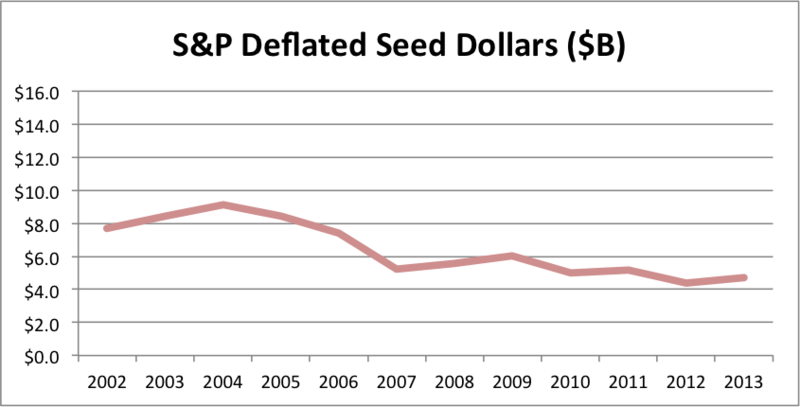 Seed stage valuations have remained flat since 2011. Adjusting for the size of the economy and our wealth, the level is still down. Kind of hard to call this situation a “bubble”. But I can live with calling it a “recovery”. Once again, see here, here, here, here, here, and here for previous posts in this thread. My data sources are the Center for Venture Research for angel data, the NVCA for VC data, and my personal tracking spreadsheet for “super angel” funds not part of the NVCA. For super angel investment, I worry most about detecting new chunks of money, not necessarily measuring the “true” level. I use the HALO report for pricing data, which goes back to 2011. Let’s look at prices, as I did in my 1H2013 post. According to the full year 2013 HALO report, the median seed valuation is still $2.5M… just like 2012… and 2011. The 75th percentile valuation is up slightly in 2013, from $3.7M to $4.2M. But the 25th percentile valuation is down a hair from $1.5M to $1.4M. According to the methodology described in the report, this data includes angel group deals before Series A. So what I think is happening is that some companies that might have gone for a VC round in the past are doing a larger angel round instead. If you check out my spreadsheet, you can see that check sizes for what the NVCA calls “seed” have taken another swing up, probably pushing some early startups out of that market. So no obvious pricing pressure. Moreover, I think the following graphs make a bubble quite unlikely. I’ve been waiting for years to pull these out. The first one “deflates” the seed investment levels by adjusting for GDP. Thus it measures how seed investment has changed relative to total economic output. The second one deflates seed investment levels by adjusting for the level of the S&P500 index (on July 1 of the given year). Thus it measures how seed investment has changed relative to the total stock of wealth. Compared to our economic output and total wealth, seed-stage investment seems like it still has a significant amount of headroom. I’m actually pretty sure I could build a darned accurate forecasting model based mostly on the S&P. Given that the index is up roughly 25% from July 2013 to July 2014, my eyeball estimate is that 1H2014’s numbers will show us somewhere around a $16B annual rate. You simply don’t have a bubble when volume is down and prices are flat! To review the history of my seed bubble watch, see here, here, here, here, and here. Recall that I use the Center for Venture Research’s angel data, the NVCA’s VC data, and my personal list of “super angel” funds not part of the NVCA. The volume calculation methodology is not designed to produce the most accurate estimate of the true number of seed-stage dollars. Rather, I want it maximally sensitive to sudden influxes in new seed money. I use the HALO report for pricing data, which started coming out in 2011. The story continues to be that traditional VCs have become increasingly irrelevant as their seed dollars have dropped 60% from 2009 to 1H2013 and their share of all seed dollars has plunged from 22% to 7.5%. Angel’s position has gradually eroded from 2011 to 2013, with their share decreasing from 88% to 77%. Super angels and seed funds have gained in share during that time, jumping from 3.0% to 15%. My guess is that trend will continue unless the individual angel pool increases via new platforms like AngelList. In any case, the new breed of funds is not growing fast enough yet to make up for decreases from other sources. [Edit 8pm: Somehow this paragraph got deleted from my draft.] There also appears to be no pricing pressure at the seed stage. According to the 2012 and 2Q2013 HALO reports, the median seed-stage pre-money valuation has remained $2.5M since 2011. Moreover, the 25th and 75th percentile valuations have actually decreased, making it hard to argue that there is some hidden dynamic masking a buildup in prices. Interestingly, the HALO report shows a continued drop in California’s share of angel group activity. From 21.0% in 2011, to 18.1% in 2012, to 17.3% in 1H2013. I’ll take this as continued confirmation that RSCM is right that some of the best values are outside the Bay Area. It will be interesting to see what the data shows for 2H2013 and 1H2014. With the S&P reaching new highs throughout 4Q2013, institutions should increase their allocations to alternative investment funds and angels should feel like they have more wealth to invest in startups. Assuming the public markets don’t experience a sudden drop in the beginning of 2014, of course.